Hi everyone, this newsletter is about the Esperanza-Edify family camp we had in a school called “Colegio Bethesda” in La Romana, Dominican Republic in July. As I mentioned earlier, I’m planning to stay here in the DR until October 11th to help out with a HOPE event here before returning to the States this fall. Do please continue to support me through the fall if you feel led. My first experience with a parachute, thankfully, was not when I had to jump out of a plane. My mother had found an old Army parachute at a yard sale, and my siblings and neighbors and I played with it for hours during a summer in the early ‘90’s. I distinctly remember talking with our resident engineer, my brother, how much time (in milliseconds) I would have to deploy the old, tattered, white parachute if I were to jump off the roof of our house. Luckily, our mother caught wind of our plans, and disabled access to the roof and scolded us enough to dissuade us from taking such a leap. What was your first experience with a parachute? My guess it was some form of summer camp when you and your friends stretched out around the edges of the colorful fabric and breathed life into the beast as you launched beach balls, water balloons, or maybe, just maybe, some young, lucky aspiring astronauts that your youth leaders deemed rugged enough to survive a few test orbit missions from your summer camp launch pad. Two weeks ago was yet another reminder to me that kids are kids, and that all the children of the world, red and yellow, black and white, they are all precious in His sight. In Microfinance, we don’t usually do summer camps for kids. We stress the importance in giving people a hand up, not a hand out. We make loans to those who live in economic poverty to help them start sustainable businesses to help them improve their economic situation on their own. In the partnership with Esperanza-Edify, we make loans to small, low-cost private schools to build more classrooms and computer labs; initiatives that increase a school’s income and improve the quality of teaching at an institution. We believe the best way to launch a child into success is with a solid education, but yes, for fun, on this particular occasion we did let the kids play with the parachute (but not physically launching them, don’t worry). 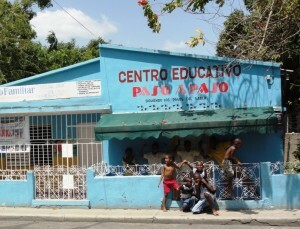 Colegio Bethesda is the economically poorest school of the 33 schools in our lending program in Esperanza-Edify. In the past 18 months we have lent over US $300,000 to projects relating to construction of new classrooms, infrastructure improvements, and computer labs. (Note: Microloans are actively being paid back so that we can use this capital to lend to other schools. I love this aspect of how microfinance works!) We make loans with good interest rates and terms to projects that will help a school in providing a better education for the children of their community, and right now we have almost 7,000 children in our program of 33 schools. Colegio Bethesda is a school that I’ve spoken about before in my newsletters and blogs; it’s a largely Haitian community, and this community is considered the economically poorest in La Romana, a large city in the east of the Dominican Republic. It’s a community where there is no regular access to water, electricity, and just 2 months ago, they got their first paved road. So to celebrate the progress over the past 12 months of Colegio Bethesda with Pastor Wisley Denis and his school administration team, and their three new classrooms they built from the loan we made last summer, we wanted to do something special. Something that we don’t normally do. With the 90 students, their parents and their community, we brought a summer camp full of activities of arts & crafts, English classes, and games. Within HOPE, Esperanza, and Edify, when we find an appropriate project to assist a school in a manner that is more donation based, we try to do it in a way that empowers the community, instead of just a group of Americans coming and giving away large gifts. Pastor Denis found workers from his congregation that wanted to make an impact in the school in the community. He was looking for parents and workers that were invested in the importance of education, so local Haitian workers from the community finished the three classrooms during the camp. I was the leader of the older kids, “Los Campeones,” (The Champions), pictured in the yellow shirts in various pictures above. Like most older kids, they were reserved, and a bit timid, just waiting for an excuse to run off some of their energy. So we passed from English and then onto crafts and finally to recreation. The chance to run and play had finally arrived. They were desperate to blow off some steam. outstretched in the courtyard of the church was displayed the color-filled canvas pulled taut by the joyous hands of 30 screaming Haitian children. The photo I captured here to the right reminds me of the spirit of joy found in children, no matter where they are from, or what color their skin is. They all just want an opportunity to play. I believe that children deserve access to good education, a teacher that encourages them and cares about their future, an administration that promotes values and discipline, adequate facilities that promote their development, and an opportunity for higher education. And there, under the parachute was a common ground, a place where we could all laugh at the majesty of the colors of our make-shift tent. We all fit, we all deserved to be there, we were all special in the way we were made. Red and yellow, black and white, they are all precious in His sight. I think most of the time in America, we worry about how much resources we have to make sure that all children are covered in the schools, lamenting that we only have room for so many. We cut programs that engender the creative prowess of our youth to make way for standardized tests and programs. Many times the kids that need it the most, don’t fit under the parachute, and sit against the wall . . . and learn that their only place is by the wall while the rest of the world gets to be underneath the glowing tent of colors. I’ve got an idea, let’s find a way to make a bigger parachute. Let’s find ways to make solid education available for more children and youth in our communities locally and internationally. It doesn’t have to be in a public school classroom, or a private school for that matter, it can take form in a church, even the courtyard of a church that’s covered in dirt and rocks. It just matters that we show up, that we make ourselves present, and that we make our youth know they too deserve to be there. By making the investment in youth, we will see our communities grow and flourish, just like Colegio Bethesda in Villa Hermosa of La Romana. This entry was posted in Beauty, Monthly Newsletter on August 14, 2012 by Aaron. This past Sunday night I went to an outdoor concert at the ruins of San Francisco in the Colonial Zone. 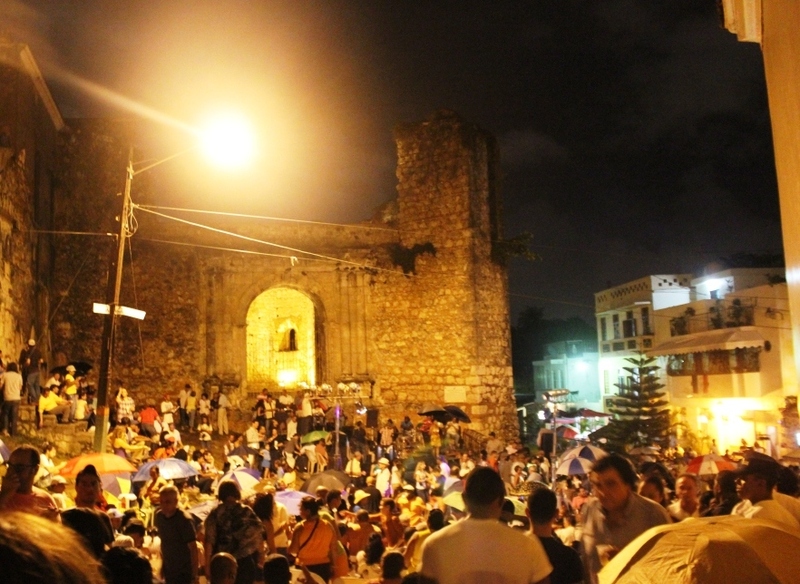 From 6:00 – 10:00pm every Sunday, a group of Caribbean music professionals put on a free show for the local community. It’s a mix of Salsa, Merengue and once in a while, Bachata. To the outsider, it’s cultural bliss. 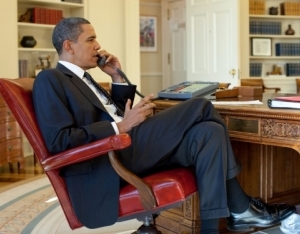 To the insider, just get there early, you don’t want to have to stand on the sidelines. 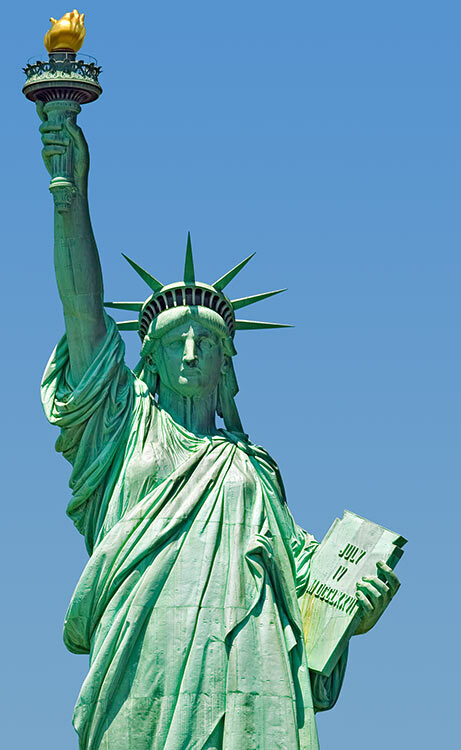 So clearly, when my group of American friends and I showed up, there were no available chairs. No problem though, we found ourselves standing next to a wall. I couldn’t help but think we were the typical wallflowers, the foreigners who had not yet learned to dance like the locals. It felt a bit like 8th grade again. On second inspection then, what appeared to be a grandpa who may have lost his way back to his seat, was instead a youthful, suave, Salsa dancing veteran decked out in red pants, red suspenders, a white shirt with accented red designs, and a red Kangol cap. If you know anything about dance, (or I suppose dating), it’s the man’s responsibility to make the lady look good. And did she! The next song. Another woman. And one more after that. Now that we had better data, we realized that this guy was in high demand, and boy was he loving it. It was clear that he both danced like no one, and yet everyone was watching him. “He had always been a dancer, my old professor. The music didn’t matter. Rock and roll, big band, the blues. He loved them all. He would close his eyes and with a blissful smile begin to move to his own sense of rhythm. It wasn’t always pretty. But then, he didn’t worry about a partner. 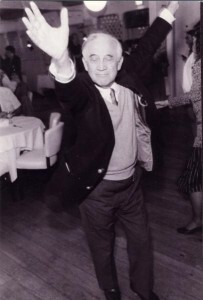 Morrie danced by himself. He used to go to this church in Harvard Square every Wednesday night for something called “Dance Free.” They had flashing lights and booming speakers and Morrie would wander in among the mostly student crowd, wearing a white T-shirt and black sweatpants and a towel around his neck, and whatever music was playing, that’s the music to which he danced. He’d do the lindy to Jimi Hendrix. He twisted and twirled, he waved his arms like a conductor on amphetamines, until sweat was dripping down the middle of his back. No one there knew he was a prominent doctor of sociology, with years of experience as a college professor and several well-respected books. They just thought he was some old nut. Well in our case, when our friend finally finished, he took off his red Kangol cap and bowed to the crowd. Hearty applause rang out. Applause to a guy who knows how to make the lady look good. I need to take some dance lessons and get there earlier next Sunday. And if I’m gonna dance like everyone’s watching I know I need to make the lady look good. This entry was posted in Dominican Republic on August 8, 2012 by Aaron. Take a look at this picture. See anything? Anything missing? It’s actually a picture of a ceiling inside the low-cost private school Colegio Paso a Paso (“Step by Step”) where someone stole the ceiling fan. I was sweating, sitting in a chair in the office of director, Haidy Guerrero, when she lamented that she couldn’t turn the fan on for me. 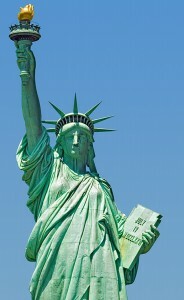 When I asked why, she pointed upwards and that’s when I took the photo. 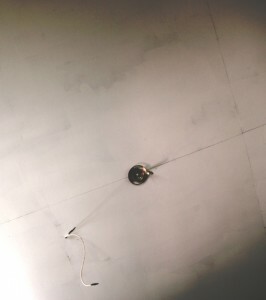 A few weeks prior, some thieves broke into the school and removed the six ceiling fans inside the classrooms. At about $65 ( a weekly salary of an average worker), that’s a $400 replacement fee that the school could not afford. I think about me, sitting there sweating, and then those kids next door, so disciplined, paying attention to their teachers, not minding the heat reverberating off the concrete block walls. Come to think of it, most of the schools in the Esperanza-Edify programs don’t have ceiling fans in their rooms. The kids just deal with it. When students are paying less than US $10 a month to go to low-cost private school it doesn’t leave a lot of room for the administration to use their funds for things like air conditioning or even fans. But if you think this is a violation of national school policies, the public schools don’t have fans, and most of these kids will go back to a home that is built from concrete blocks, where one or two wall fans will cool of the five or eight members of their family. It makes me wonder then, if these thieves broke into the school for the fans, did they install them in their own homes? Probably not, they resold them for the cash. It’s hot in the Dominican Republic, and the demand for cool air is high. Hi everyone, this newsletter is about June and the HOPE International savings groups in Comas, Peru, and the July newsletter will be about the Esperanza-Edify family camp we had in Colegio Bethesda in La Romana, Dominican Republic. On another note, although my final date was to be August, I’m planning on staying to early October to help with an annual HOPE event here in the DR. Do please continue to support me if you feel led. More on my Fall departure will come in the next newsletters, and on my blog. “I didn’t know how to save my money, but now I do.” is what Olga, 52 years old, member of the “Good Seed” savings group in Comas, Peru told me. Have you ever said that to someone? (Or do you know how to save?) Has your budget ever come up short during a month? Have you ever wanted to buy something but felt that it was just out of your reach? These are the questions that I use daily when talking with people about their money and their hopes and dreams for the future. In Olga’s case, she has been excited about putting away $2-3 a week, something she’s never done before in her life, and is amazed to see her stock pile grow which she will use to make inventory purchases in the future. 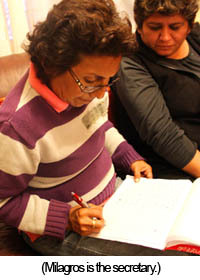 Last month, I had the opportunity to go work in Lima, Peru for six days during June 20-26 to help a volunteer from HOPE, Cindy Kalinoski, www.thewordhelper.com, do a series of interviews of the savings group members, the program team, and the local church that was implementing the project. 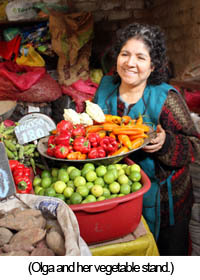 As a translator, it was my job to schedule the trips to the local market and facilitate the interviews while Cindy carried out the content of each meeting. 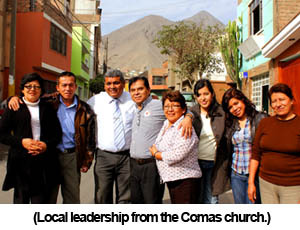 Our work took us through three local markets of three districts of North Lima. 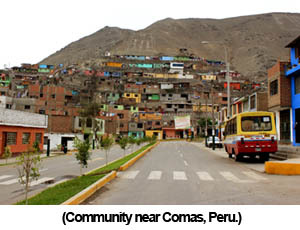 Lima, Peru has a population of nearly 30 million people, and roughly nine million of those live in the capital in one of 36 districts. It was interesting and very enjoyable to be in another Latin American country that spoke Spanish, but instead of sea-level plains and Carribean plants, I was surrounded by mountains and the noise and hustle and bustle of the city. In North Lima, our home base was a district called Comas where HOPE International has a partnership with the local church Iglesia Alianza Cristiana y Misionera de Comas (www.acymcomas.org) to carry out a savings group program. Members of the group make weekly savings deposits when they meet in small groups of their local congregation, and the groups save their funds together as a form of accountability and support. This similar savings model is what HOPE savings programs look like in Rwanda where we have more than 100,000 members with a partnership Urewego Bank (www.uomb.org), and in the Philippines where we have more than 200,000 members with a partnership with CCT (http://cct.org.ph). The Comas church has been excited about this project because by offering this savings tool coupled with a financial ministry they are able to reach people they would never be able to meet by traditional methods. 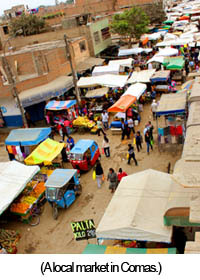 A basic strategy of finding new clients is to walk around through the markets (pictured right) and ask them where they do their banking and where they go to church. A member of the leadership team can then invite them to church and to the savings groups they are promoting. Simple and effective. In Comas, Peru, in South and Central America, and indeed here in the Dominican Republic, you’ll see in most economically poor areas that there is a basic lack of financial services: checking accounts, savings accounts, and reasonable rates for loans. In America, we don’t even think twice about not having access to these services. With advertisements on our local streets or arriving in the mail, we are inundated with offers. But in talking with the members of these seven savings groups in Peru, getting a savings account is pretty tough with the account requirements, distance to local banks, and the limited service hours. This is why HOPE promotes savings groups, and their specific strategy is managing these programs through an established community like a church. I believe now more than ever that in order to have overseas development work well, we have to partner with local leaders. I was overjoyed to meet Pastor Roberto Peche and his family (pictured above wearing a tie with the leadership team). He’s in charge of the men’s ministry for the church and the financial ministry with the savings groups. He has such a passion for teaching and discipleship and this program allows him to go out into the communities to give them financial tools and training to prosper in their businesses. 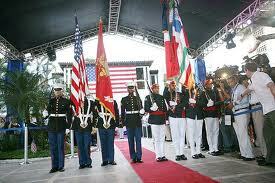 Take for example the case of Milagros (pictured right.) She joined this savings group from the church about 10 months ago, when Pastor Roberto and his team came through the market where she was working. Through the savings group she learned how to manage her money, create her own budget, make plans for a future business, and was given a position of leadership and responsibility as the secretary of the group. What’s most exciting is that recently, when the group was mature and built up its savings funds, the group gave Milagros a loan for $75. With that $75 dollars she was able to buy more inventory for her store. I love this idea that this business that you see in the left picture did not exist 3 months ago, but with this loan from her savings group, a community of her friends, she was able to fulfill a lifelong dream – owning her own store. 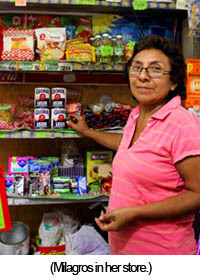 This store provides the necessary income for her and her three children, and since it is the only one in the local neighborhood she is helping her community have better access to needed goods. For us, maybe the idea of saving a few dollars isn’t anything special, but if you were to put yourself in the shoes of someone like Milagros or Olga, people who have no easy access to financial services, saving money was hard. But now, even these few dollars can make a big difference in their lives. They began trusting in the promise of savings, the promise of the solidarity and community that they find in their group, and a new hope in the truth they are finding in the church community, as many of the women in the group were not active church goers in the past. I think so often that for us, we put so much stock in what we make, or what we are able to earn and buy. It can represent the value we have for ourselves and what we show our friends and family. We can get lost in what the role and the utility of money should be, and make it something more important than it is. By talking with these members of the savings groups, I see the value in appreciating money in the right way and by trusting in the promise of the Bible. I pray that you would see the value in saving your money to save for the good purchases in life, and that stockpiling or making money would not distract you from what is really important. This entry was posted in Monthly Newsletter on August 3, 2012 by Aaron.